A survey of blood selenium (Se) concentrations in Norwegian Red heifers and dry period cows was conducted to reveal possible association to management, feeding, health and fertility. Selenium contents were determined in 254 herd blood samples consisting of pooled samples from individual non-lactating animals from herds in 5 counties. The Se concentrations showed a normal distribution with mean 0.09 μg Se/g blood, with a standard deviation (SD) of 0.05, and ranged from 0.02 to 0.23 μg/g, with 50 % of the samples being between 0.06 and 0.11 μg/g. The herds with Se concentrations below 0.06 μg/g were smaller (21.4 ± 8.7 cow-years) than those with Se levels above 0.11 μg/g (27.5 ± 14.1 cow-years) (P < 0.01), but there were no differences in milk yield, incidence of replacement, proportion of animal culling, amount of concentrate or grass silage as percentage of energy consumption between the groups. Treatment registration records showed a tendency that more animals in the low Se herds were treated for all the diseases included in this investigation (64.8 animals per 100 cow-years) than those in the high Se herds (57.5 per 100 cow-years), while no such differences were revealed for individual disorders. There was, however, a significant difference in bulk milk somatic cell counts (BMSCC) between low and high Se herds, their values being 137 000 and 155 000 cells/ml, respectively. This difference was significantly influenced by herd size. Furthermore, a total of 4 916 lactations were analyzed from individual health and fertility recordings, including 2 934 first lactations and 1 982 later lactations. The present study revealed a reduced incidence of disease treatment with increased Se concentrations from 0.02 to 0.23 μg Se/g blood. In this regard, there seemed to be an optimum of 0.10 to 0.15 μg Se/g for all types of mastitis treatments summarized, and for treatment of retained placenta. 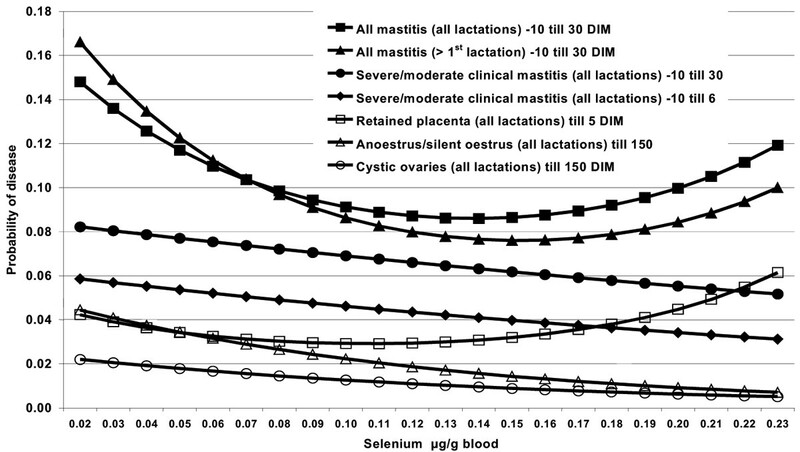 Thus, herd Se concentrations below and above these values was connected with increased probability for sum mastitis and retained placenta, reflecting the effect of the quadratic term of Se. The cow (composite) milk somatic cell count (SCC) was lower in lactations from low Se herds than in high Se herds with a marked SCC increase in the Se concentration interval from 0.11–0.13 μg/g blood. In conclusion, heifers and dry period cows in Norway are low in blood Se content and there seems to be a positive association between increased blood Se concentration pre partum and decreased incidence of mastitis, ovarian cysts and anoestrus/silent oestrus post partum. Seleninnhold i besetningsblodprøver i relasjon til helse og fruktbarhet i norske melkekubesetninger. En kartlegging av selen-innholdet (Se) i blod hos NRF kviger og sinkyr ble gjennomført for å avsløre mulige sammenhenger med management, fôring, helse og fruktbarhet. Se ble undersøkt i besetningsprøver fra ikke-lakterende dyr i 254 besetninger i 5 fylker. Se-konsentrasjonene var normalfordelt med gjennomsnitt 0,09 μg Se/g blod, standard avvik (SD) 0,05, og variasjonsbredde fra 0,02 til 0,23 μg/g, med 50 % av prøvene i området fra 0,06 til 0,11 μg/g. Besetninger med Se konsentrasjon lavere enn 0,06 μg/g var mindre (21,4 ± 8,7 årskyr) enn de med Se over 0,11 μg/g (27,5 ± 14,1 årskyr) (P<0,01), men det var ingen forskjell i ytelse, rekrutterings %, andel utrangering av dyr, kraftfôr % eller andel surfôr i de to gruppene. I besetninger med lavt Se var det en tendens til at flere dyr var rapportert behandlet for alle sjukdommer sett under ett (64,8 dyr per 100 årskyr) enn i besetninger med høyt Se (57,5 per 100 årskyr), mens det ikke var forskjell i behandlingsfrekvens når sjukdommene ble analysert separat. Det var signifikant forskjell i celletall i tankmelk (BMSCC) i be- setninger med lavt og høyt Se, henholdsvis 137 000 og 155 000 celler/ml, en forskjell som var signifikant påvirket av besetningsstørrelse. Til sammen ble 4 916 laktasjoner, 2 934 fra første laktasjon og 1 982 fra senere laktasjoner, analysert for individuelle helse- og fruktbarhetsregistreringer. Studien viste en redusert sannsynlighet for å få sjukdom med økte Se konsentrasjoner i området fra 0,02 til 0,23 μg Se/g blod. Når det gjelder forekomst av alle typer mastittbehandlinger sett under ett og tilbakeholdt etterbyrd, synes det å være et optimalområde fra 0,10 til 0,15 μg Se/g. Se konsentrasjoner under og over dette området var forbundet med økt sannsynlighet for alle typer mastitt sett under ett og tilbakeholdt etterbyrd, vist ved effekten av annengradsleddet til Se. Ku-celletallet (SCC) var lavere i laktasjoner fra besetninger med lavt Se enn i de med høyt Se, med en markert økning av SCC i intervallet 0,11-0,13 μg/g blod. Konklusjonen er at kviger og sinkyr i Norge har lavt innhold av Se i blodet, og at det synes å være en positiv sammenheng mellom økende Se konsentrasjon i blod pre partum og redusert forekomst av mastitt, ovariecyter og anøstrus/stille brunst post partum. Selenium (Se) is a micronutrient that is essential in several biological functions in the organism, particularly in protection of cell membranes. Se is known to be incorporated in the enzyme glutathione peroxidase performing the antioxidative defense of the body by eliminating hydrogen peroxides. Several selenoproteins have later been identified, with functions connected e.g. to the thyroid hormone metabolism, testes and sperm function and muscle metabolism . In addition to glutathione peroxidase enzymes, thioredoxin reductase, iodothyronine deiodinase enzymes, selenoprotein P and selenoprotein W are well characterized selenoproteins concerning their biological functions . Se-deficient diet is a well-known cause of nutritional muscular disease, and is also connected to ill-thrift, reduced growth rate, retained placenta, impaired fertility and mastitis in ruminants . In cattle, fertility has been improved by supplemental administration of vitamin E and Se as shown by , while others have not found association between herd Se concentrations and fertility parameters [28, 16]. The incidence of metritis and ovarian cysts has been shown to decline in animals treated with Se injections , and the incidence of retained placenta declined when Se was given alone  or in combination with vitamin E [13, 18]. The positive role of Se in the immune system is well documented, where it stimulates both humoral and cell-mediated immunity [20, 7, 22]. Many clinical and epidemiological studies have revealed a positive association between Se supplementation, either alone or in combination with vitamin E, and udder health [31, 14, 21]. Both the severity and duration of natural and induced infections as well as somatic cell count (SCC) have been shown to be associated with Se status of the animals [29, 4–6, 16]. In Norway, as in other Nordic countries, the content of Se in soil is low . Thus, the Se content in plants is low , and cultivated roughage cannot alone supply the animals with the recommended daily intake of Se. For this reason, Se is added as sodium selenite to all types of commercial concentrate in Norway . Almost all Norwegian milk producers choose commercial concentrate for their production. Se enrichment of concentrates does not, however, ensure adequate Se intake of heifers and dry period cows fed mainly roughage. The aims of the present study were to determine the blood Se levels of Norwegian Red animals fed without concentrates, and to reveal possible associations between the herd levels of Se and management, feeding, health and fertility. In addition, Se herd levels were compared with individual health and fertility recordings of animals having calved within a limited period relative to the time of blood sampling. A total of 275 herds with at least 15 whole lactation cows with seasonal calving in the counties of Hedmark, Oppland, Rogaland and Trøndelag in southern Norway were originally included in the investigation. Due to lack of data or incorrect data collection, 21 herds were excluded. Thus, 254 herds were included in the final study. Blood samples were collected once at each herd, primarily from heifers 3 to 5 weeks before parturition. In herds where the number of heifers was <5, dry period cows with the same expected calving period were included. The blood was sampled individually on heparin tubes and pooled with equal parts to a herd sample before storage at -20°C until the time of analysis. As a standard practice in Norway, all commercial concentrates are enriched with Se, hence the animals included for blood collection were expected to be given no concentrate at the time of sampling. Vitamin or mineral supplementation was not registered. Selenium was measured in whole blood. The blood samples (1 g) were digested in a mixture of pro analysis nitric and perchloric acids (3+1 v/v, 16 ml) (Merck, Darmstadt, Germany) . The Se content was determined by atomic absorption spectroscopy (SpectrAA400, Varian Inc., Mulgrave, Australia) with a hydride generator system after dilution to 25 ml with deionized water (resistivity >10 MΩ × cm). The results are reported as μg Se/g wet weight blood. An accredited method (Norwegian Accreditation (P110)) was employed, with detection limit 0.01 μg Se/g blood. All data concerning production and events such as calving, culling, reproduction and disease were extracted from the animal recording database managed by TINE Dairy Association , and were presented according to principles recommended by . Consumption of each feedstuff is estimated as percentage energy intake on yearly basis. Information about the concentrate amounts is fairly accurate, whereas the other feedstuffs available are calculated according to the need for production and maintenance. Reproductive performance was measured by the fertility index (FS-value) and calving intervals. The FS-value is calculated on combined data for 60 days non return rates, return rate 0–3 days post insemination, number of inseminations per heifer or cow, interval from calving to last insemination and culling due to fertility problems . The mean and standard deviation (SD) of blood Se content was calculated for each region. Herd level data for production, feedstuff, health and fertility for the year the blood sampling was performed, was extracted from the Dairy Herd Recording System. Herd health and production data were missing for 2 herds, which were excluded from further analysis. Herds were grouped from relatively low (<0.06 μg/g) to medium (0.06–0.11 μg/g) and high (>0.11 μg/g) Se concentrations based on distribution and balance in the material, looking at the two 25% quartiles. Herds with relatively low blood Se values (<0.06 μg/g) were compared to herds with relatively high Se values (>0.11 μg/g) for production, feedstuff, health and fertility parameters using a Student's t-test analysis. The relative risk (RR) was calculated as the p(acc)0 for one class divided by the p(acc)0 at the same day for another class. The Se concentrations in the blood of non-lactating animals were normal distributed with mean 0.09 μg/g and SD 0.05, representing 254 herds. The Se concentrations ranged from 0.02 to 0.23 μg/g, with 50% of the samples being between 0.06 and 0.11 μg/g. The Se content for herds in the different counties is given in Table 1. Blood Se concentration, mean with standard deviation (SD) of herd samples from heifers and dry period cows in different counties of Norway. Sixty herds were in the low Se group, 121 in the medium and 71 were in the high Se group. Comparison of herds with relatively low and high blood Se revealed some differences in herd level management, feedstuff and health. The herds with low blood Se were smaller (21.4 ± 8.7 cow-years) than those with high Se (27.5 ± 14.1 cow-years) (P < 0.01). There was no difference in milk yield, incidence of replacement or proportion of animal culling. The amounts of concentrate and grass silage, as percentage of energy consumption was not different in the two groups of herds. The herds in the low Se group used less ammonia-treated straw, less turnips and brewer's grain in the feeding ration (P < 0.05). Treatment registration records showed a tendency (P = 0.09) that more animals in the low Se herds were treated for all the diseases included in this investigation (64.8 animals per 100 cow-years) compared with those in the high Se herds (57.5 per 100 cow-years). However, there were no differences when looking at each one of the separately registered diseases or reproductive performance measured by the FS-value and calving intervals. 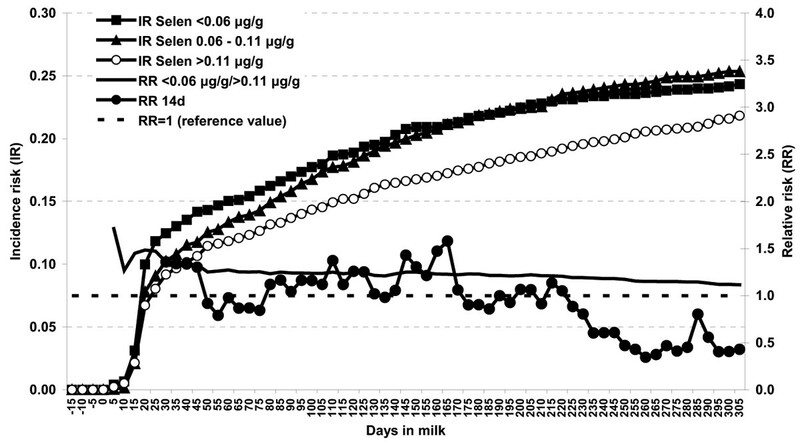 There was significant difference in average bulk milk somatic cell counts (BMSCC) in low and high Se herds, where values were 137 000 and 155 000 cells/ml, respectively (P = 0.03). This difference was, however, significantly influenced by herd size. A general linear regression analysis revealed that the association between BMSCC and Se and herd size was: BMSCC = 110 (± 10.8) + 114 (± 69.98) * Se + 0.817 (± 0.36) * number of cow-years (P = 0.10 for Se and P = 0.02 for herd size). The parameters compared in the three Se herd groups are shown in Table 2. Parameters related to management, production, feeding, fertility and health given as average for herds with low (<0.06 μg Se/g), medium (0.06–0.11 μg Se/g) and high blood Se concentrations (>0.11 μg Se/g). * number per 100 cow-years (CY). In total, 4 916 lactations were analyzed for individual health and fertility recordings including 2 934 first lactations and 1 982 later lactations. The general trend was a reduced probability of disease with increased Se concentrations from 0.02 to 0.23 μg Se/g blood in this material. For all mastitis codes together and for retained placenta, however, a tendency to increased disease probability at blood Se concentrations above approximately 0.15 to 0.17 μg Se/g was observed, reflecting the effect of the quadratic term of Se. The SCC was lower in lactations from low Se herds than in high Se herds (P < 0.001) with a marked increase in the Se concentration interval 0.11–0.13 μg/g blood. The regression coefficient (b1) was 2.06 in lactation number one and 1.02 for older parities. The effect of Se and Se2 on individual health and fertility parameters are given in Table 3 as values from the regression model with standard deviation. The estimated mean probability according to some of the models in Table 3 is presented in Figure 1. The results of models with logistic regression for the effect of Se and Se2 presented by the intercept (a), regression coefficient of Se (b1) and the regression coefficient of Se2 (b2) on mastitis and reproductive diseases during specified observational time and stratified into first, older or all lactations. Estimated probabilities of different diseases according to Se concentration, based on results of the models in Table 3. The accumulated risk of mastitis treatment throughout lactation in the three Se classes at herd level is illustrated in Figure 2. The RR was approximately 1.3 to 1.4 higher in the herds with selenium concentrations <0.06 μg Se/g blood compared to the herds with >0.11 μg Se/g blood until day 30 into the lactation. After day 30 in lactation the accumulated risk rate showed an increase at the same rate. The herds with Se concentrations between 0.06 and 0.11 μg Se/g blood showed a risk rate level between the two extreme classes, except after 120 DIM (Figure 2). Estimated accumulated incidence risk (IR) of mastitis treatments at three different selenium concentrations and relative risk (RR) comparing selenium concentration <0.06 with > 0.11 μg/g blood throughout lactation from -15 to 305 days in milk. RR 14 days is the average RR for each period of the 14 preceding days in milk. The results show that Norwegian Red heifers and dry period cows generally have low blood Se contents, as earlier demonstrated by . Deficient or marginally deficient animals according to recommended concentrations of >0.10 μg Se/g blood (National Veterinary Institute, Norway) was reflected in 71.2% of the herd samples. Feedstuffs cultivated in Norway are low in Se content , reflecting the low bioavailability of Se in soil . Animals fed only roughage will have an intake of Se below recommended doses, in accordance with . There was a variation in herd blood Se levels between counties in Norway. Hedmark county herds had relatively high concentrations of Se. This county also had the largest herds, indicating a different animal management, e.g. mineral supplementation in large herds rather than higher plant Se content. Correspondingly, we found that herds with low Se concentrations were smaller than herds with high Se concentrations. When herds with low Se were compared with herds with high Se concentrations there was no difference in concentrate as percentage of energy consumption or milk yield. The last finding seems to be in contrast to , who demonstrated an increased milk production during the first 12 weeks of lactation in cows treated with Se and vitamin E the last 3 weeks before parturition. However, our results are based on whole lactations on herd level, whereas  looked at individual lactations in a restricted period. With regard to feeding, the only difference of significance was the amount of NH3-treated straw, turnips and brewer's grain being used. This finding is, however, assumed to have had no influence on blood Se concentration, since the amounts of these feedstuffs were small in both herd categories. There was no difference in reported cases of mastitis, reproductive disorders or other specific diseases, and there was no difference in reproductive efficiency parameters in herd level data for the year of sampling. There was, however, a tendency of more reported cases of disease in the herds with low Se than in herds with high Se, indicating a positive influence of Se on health of the cows possibly by stimulation of the immune system [20, 7, 22]. On the other hand, the BMSCC was lower in low Se herds than in high Se herds, a finding that was significantly influenced by the herd effect. This result did not confirm a positive association of Se and immune function as demonstrated by  and by in vitro studies of Se-supplemented neutrophils by [23, 24]. On lactation level, the situation seemed more specific. The herd Se concentration was negatively correlated with the incidence of moderate and severe clinical mastitis when all lactation numbers are considered, a finding being in compliance with other results showing the positive association between Se and udder health [31, 14, 21]. However, there was no such significant effect when looking at first lactation cows alone. The situation was similar for the period 10 days before calving to 6 or 30 days after calving, and also for all types of mastitis treatment from 10 days before to 30 days after calving. High Se concentrations were also associated with reduced incidence of cystic ovaries as shown by , and anoestrus/silent oestrus. Because of the relatively low treatment incidence for these diseases all lactation numbers were analyzed together. The incidence of retained placenta was not related to the Se concentrations, a result seeming to be in compliance with . However, when analyzing the data for effect of Se2, a decrease in the incidence of retained placenta at a restricted blood Se level was found. A similar tendency of Se2-effect was also seen for all mastitis types together. High Se concentrations were associated with higher SCC, especially in first parity, which is in contrast to the findings of . Our results indicate that there is an optimum concentration of Se, at least for protection against some diseases. The positive effect of Se on mammary gland immune defense is further demonstrated by the accumulated risk for mastitis throughout lactation. Animals in herds with low Se concentration had 1.3 to 1.4 times higher relative risk to get mastitis during the first 30 days of lactation than animals in herds with high concentrations of Se. From day 30 of lactation the risk increased at the same rate in both herd categories, which may be explained by supplement of Se from the concentrate, containing approximately 0.4 mg Se per kg dry matter. When animals are given 30 % of the dry matter as concentrate, which is the case with high milking cows from the time of calving, the animals should have enough supply of Se. The finding that the influence of Se was more clearly expressed when looking at lactation data in comparison to herd data, might reflect that the Se status of heifers and dry period cows vary through the year within herds. Thus, the restricted data should represent a more homogeneous population within herds concerning the Se status obtained by our blood sampling. The data on lactation level was restricted to those having a calving date within a period of 100 days before or after the day of blood collection. This period might seem long, representing a herd concentration of Se based on Se determination one day within the period. The sampling was, however, standardized to heifers and dry period cows that were given no or very small amounts of concentrate. Their feed consisted of roughage grown on the farm, which is the same type of feed offered to all heifers and dry period cows in the period in question, and we therefore claim that the Se status of the herd is representative for cows and heifers investigated in this period. This assumption was supported by repeated analysis with an even more restricted period. However, the significances disappeared, due to lost power in the analyses by the great reduction in lactations investigated. Other nutrients, particularly vitamin E, may have influenced on the health and reproduction parameters registered. Heifers and dry period cows in Norway are low in blood Se, and supplementation according to standards is recommended to these animal categories. There seems to be a positive association between high blood Se concentration and low incidence of mastitis, ovarian cysts and anoestrus/silent oestrus. Concerning all mastitis treatments summarized and retained placenta there may be an optimum level for blood Se content. In this study, high Se concentrations were associated with higher SCC. Reprints may be obtained from: E. Kommisrud, Geno, NO-2326 Hamar, Norway. E-mail: elisabeth.kommisrud@geno.no, tel: +47-62520600, fax: +47-62520610. This study was supported by TINE BA, Norwegian Dairy Association and Geno Breeding and AI Association. Access to data was given by the Norwegian Dairy Herd Recording System and the Norwegian Cattle Health Services (for health data) in accordance with agreement number 12/2002. We thank the veterinary surgeons O. H. Fossen, P. Voldhagen, E. Kummen, P. Gillund, P. Nordland and B. Gulbrandsen for collecting of blood samples and K. Sørensen for technical assistance; they are all employees of Geno Breeding and AI Association. A. Bernhoft performed the analyses of selenium, and C. Plassen and M. Strand provided technical assistance; they are all employees at the National Veterinary Institute, Norway.